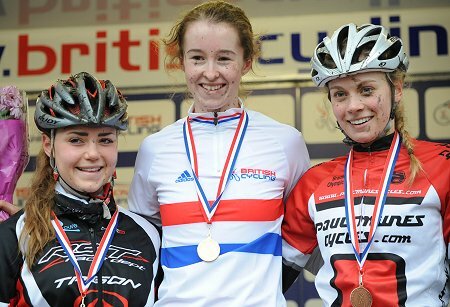 During the winter, a first year junior was giving the country’s top cyclo-cross women a run for their money and Abby finished the series fourth overall and first Junior. The Hartshead rider then backed that up with a Silver in the Cyclo-Cross Championships after being in the Gold medal position for most of the race. The look of disappointment on her face said it all – the young lady needs to win and that’s the mark of a champion in the making. Being so young (first year junior), you’d think the palmares would be a little thin on the ground but not Abby! The RST/NFTO rider has achieved so much already that it is clear she will continue to star in Women’s racing. Her mum, Lisa Brambani was a high achiever during her career as a racer. As well as having represented Great Britain in the Olympics Games (11th) as well as a 3rd in the Tour de l’Aude Cycliste FÃ©minin in France, Lisa was also second in the Commonwealth Games Road Race (New Zealand) and between 1986 and 1989, Lisa won the British Womenâ€™s RR title each and every year. Abby did a lot more than that though with rides in World Cups (Cyclo-Cross) including one against a rider she admires, Marianne Vos and a race in China where Abby was 13th (Adela Carter was 3rd & Hannah Payton 7th). VeloUK: How did you feel your cyclo-cross season went when you were challenging the seniors in the National Trophy events? Abby: I felt I had a good season. I didn’t expect to be up there with the women but it was great fun. I haven’t been specifically training for cross at all (my training programme is based on track) so any result was a bonus I guess. 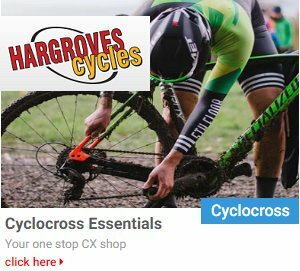 VeloUK: What do you enjoy most about cyclo-cross? Abby: I enjoy the camaraderie involved with cross. I love how everyone is so friendly and will help out if you have a problem; itâ€™s like a big family who meet up every weekend. Chris Young is fantastic, he rode at the same time as my mum and he has taught me so much about cross. He has so much patience and his enthusiasm is infectious! 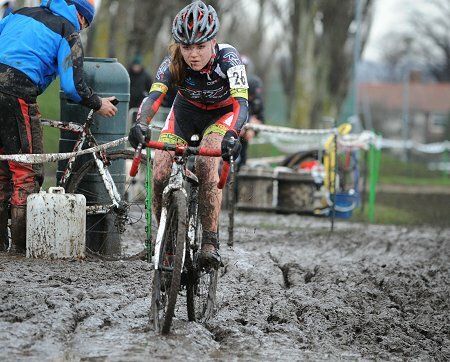 VeloUK: Do you have any tips for young girls who have not done cyclo-cross? Abby: I would say, give it a go! Borrow a bike and go with no expectations. You will get muddy, you will fall off but you will also learn how to control your bike and this has helped me so much for road events and even track racing. I am not a girl who enjoys getting muddy but cyclo cross gets under your skin and the next thing you know you can’t wait to get out there slipping around on two wheels! VeloUK: You rode a Trigon (from Cycle Division) with disc brakes in cross – did you feel they were better than the calipers? Abby: Well everyone has an opinion, but for me I love them. I was not confident at cornering and the technical parts but the disc brakes enabled me to really work the corners and 100% know that as soon as I touch the brakes, I will stop! I am told that they are harder to maintain, but I couldn’t comment on that LoL! 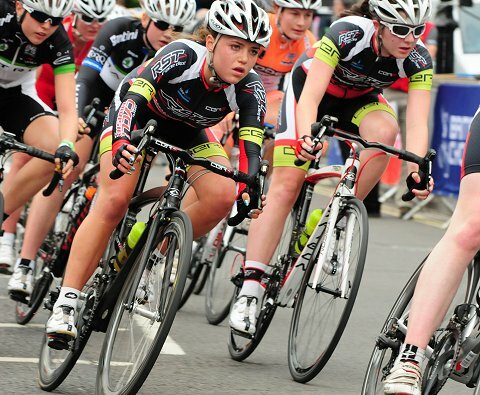 VeloUK: You have a women’s team for 2014 – how exciting is that for you? 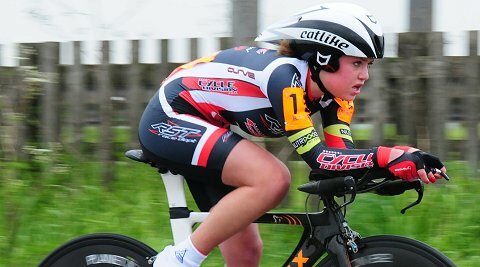 Abby: The RST/NFTO Girls Team is so exciting! We all know each other and are all juniors, three first year and three second year. Of course Grace and I have raced together for the past two years (in RST colours) so know each other very well. We complement each other’s strengths and weaknesses… G is one of the best sprinters around and she knows I can deliver a strong lead out. We are all really close, we talk to each other on an almost daily basis. We want to have fun, learn and hopefully pick up a win! That would be great! 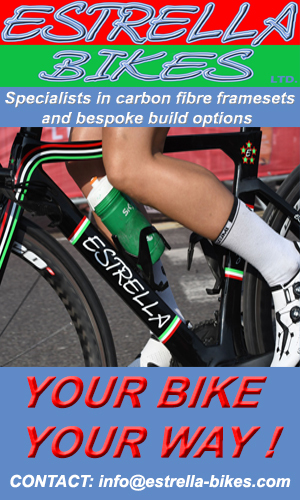 VeloUK: Do you have any goals planned yet for what you want to achieve in 2014? Abby: I do have some goals, yes! A mix between track and road and Time Trials. VeloUK: You have some pretty special bikes riding for RST – what is your favourite? Abby: That’s a tough one. I love all my bikes! My Trigon road bike for last year was amazing, so light and a perfect fit! I am very small so getting a bike to fit is quite a task! This season, the girls team are riding Swift bikes. Grace and I are getting the XXS size and we are both looking forward to that, they look amazing! 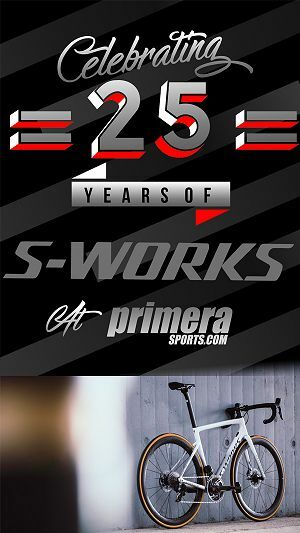 Also ‘The Shed’ are in the process of building my new Time Trial bike which is just awesome… I am beyond excited about it! 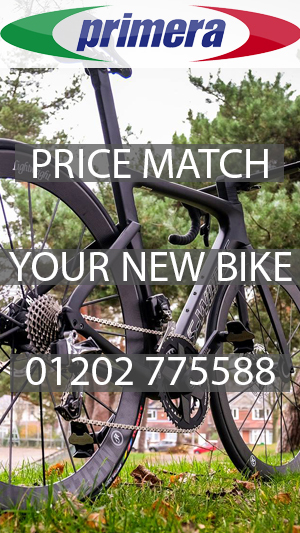 VeloUK: Who chose the set up for your bikes? Abby: My dad usually chooses what goes on my bikes because he’s a bit of a bike ‘anorak’ and he likes all the bling stuff. The set up for the new bikes has been chosen by the team management as a group. The stuff for my TT bike has been a joint effort between my dad and John Wood (NFTO Boss). 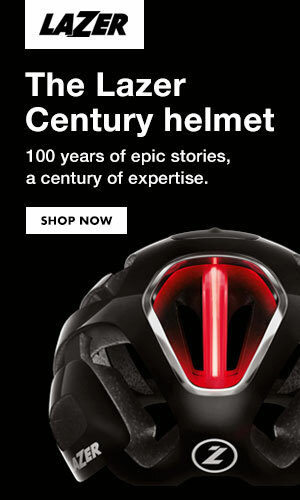 I think they set out to make it the best bike on the road! VeloUK: Are you still at school? Abby: Yes, I am at sixth form at Bradford Grammar School studying A levels in Biology, Geography and PE. I have been there since I was 7 year old. The Brownlee Brothers and Adrian Moorhouse went there so the school really goes out of their way to help accommodate my sporting commitments. 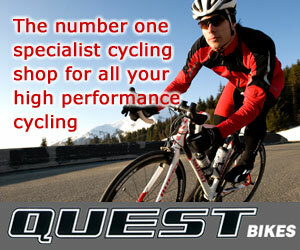 VeloUK: How many hours a week do you train at the moment? Abby: This varies from week to week depending upon what events or races are taking place. I did a lot of miles over Christmas, but usually don’t do anything over four hours. Abby: My coach is Matthew Winston. This year I am on the GB ODP. It’s the first time I have been on a BC programme, as I wasn’t selected for Talent Team. I am enjoying working with Matt, I think he understands me and has a great sense of humour, which helps! 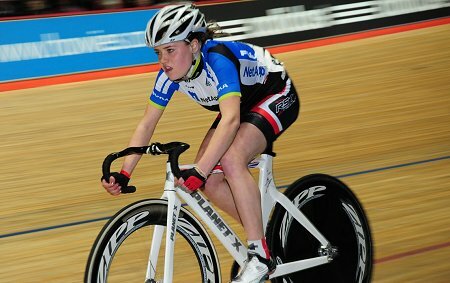 Abby on the track in 2012 riding in NetApp-Endura colours at Revolution. VeloUK: What is your long term goal in the sport – to race on the road in Europe? Abby: Well, short term I would love to stay on ODP for two years which will take me to the end of the Junior ranks and the end of my studies. Long term, riding on a European or American Team and living abroad is something which appeals to me.